The Face Shop Blueberry Face Mask - Yay or Nay? Home ReviewsBeauty The Face Shop Blueberry Face Mask – Yay or Nay? The Face Shop Blueberry Face Mask – Yay or Nay? Who is it for? 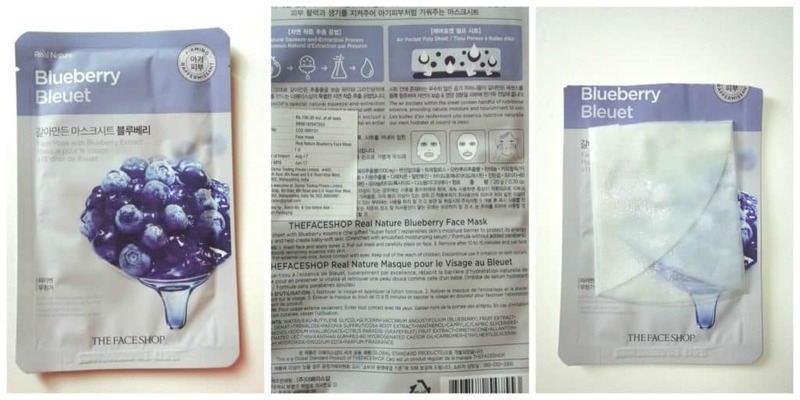 The Face Shop Blueberry Face Mask is for you if your skin has become pale, dried out, then you need something that firms your skin and adds back vitality. Unfold the mask and carefully place it on your freshly cleansed face, avoiding the eye and mouth contours. Remove after 10-12 minutes and tap gently on the skin until the serum is completely absorbed. The mask comes in a well secured, travel-friendly, matte finish, purple, white colored plastic pouch that has blueberries printed on it. The packaging looks nice and fruity, all the details are printed on the backside. The pouch contains single sheet mask soaked in water-based essence, the sheet is nicely folded inside the pouch. Also as a bonus, you get the extra essence in the pouch which you need to gently dab into your skin after you are done with sheet mask. This blueberry mask has a very strong scent of berries that totally bugs Me. If you don’t like the smell of berries then this mask is a definite NO for you, the smell lingers for good 2 hours. Okay, so I had truckloads of expectations from this product because of 2 specific reasons. 1 It comes with a tag of firming skin. So, basically, this seemed to be a powerhouse of all the essential nutrients which my skin was raving for.. I personally exfoliated my skin before putting on this sheet masks, in order to extract all the gunk out and restore all the goodness in your skin. Initially, this mask felt soothing, it calmed my skin, but this neither added any extra glow nor did it do any good to my skin. This is sheet mask was such a disappointment guys. By now I have tried a good number of sheet masks, none have been disappointing. After 2 hours my skin felt the same. And I had to apply, extra leftover serum in the pouch. Which I generally store for next morning. or apply on the back of my hands. So overall this sheet mask is a total nay from my experience. Doesn’t lives up to its tag of firming skin. Does no good or harm to your skin… Basically, it’s not even worth trying. The smell doesn’t feel soothing. Feels sticky, yet no hydration. Will I recommend or repurchase this product? Nope to both.. This one can be skipped, I have combination skin. Most of the sheet masks have worked too well for me. This one majorly failed at my expectations. You can go on to try another variant which is meant for firming skin. More Face Shop Face Masks? The Face Shop Mask Tea Tree: Hot Or Not? The Face Shop Mask: Peony | Just WOW!